Gwynneth Boyce - Ettalong Beach Arts & Craft Centre Inc.Ettalong Beach Arts & Craft Centre Inc.
Ettalong Beach Arts & Craft Centre Inc.
Gwynneth Boyce enjoys painting most subjects but especially portraits and seascapes. Pastels and oils are her preferred medium, but she also works in graphite and charcoal. Gwynneth has won many awards and her work has been reproduced in The International Artists Magazine. 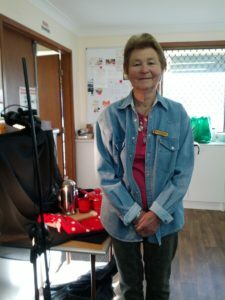 For many years Gwynneth lived in Queensland where she was well known as a committee member, teacher and volunteer at the renowned Redcliffe Art Society where she is Life Member and Sponsor. She was an inaugural installation volunteer at The Redcliffe Regional Art Gallery. Now living locally on the Central Coast, we are delighted that Gwynneth has become actively involved in EBACC as a tutor of both our workshops and the Painting and Drawing Class.